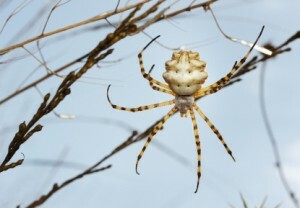 While spiders are a beneficial arachnid, some carry venom that can be very poisonous to people. This page has answers to the question: Please tell me how to get rid of spiders and their webs from my backyard? The primary method recommended is using Diatomaceous Earth to eliminate spiders around your home. Diatomaceous Earth dries out a spider's exoskeleton causing them to die. While deadly to spiders and many insects, Diatomaceous Earth is generally safe for humans and other animals. Please tell me how to get rid of spiders and their webs from my backyard. I would like to kill them as I hate them so much and don't want them to come back. I would also like to know what will deter them. I live in Australia and my back yard is full of them. I am so scared of them and the webs, I can't even hang the washing out. Research diatomaceous earth. It is nontoxic and harmless to people and animals, but kills all insects beneficial or not, which is a consideration. You would have to spread it throughout your whole yard, you might want to combine this with something else. Hope this helps. Some of your "down under" spiders are deadly so don't blame you for being afraid. Spiders have taken over my house, outside mostly but have a problem inside as well. They are very annoying. They make webs all over my porch every night. I literally have to go outside and deweb my porch every day. They put up with those annoying huge circular webs all over my siding and windows, and anything else that happens to be on the porch. I have a very nice open porch that we would like to be able to enjoy, but it is very difficult to do when I have to deal with these spiders and the extra work they give me removing their webs. We see the spiders more at night. They come out and hang everywhere. We don't feel comfortable sitting out there with these scary looking creatures all over the place. I had read someone else's post about leaving them alone because they are beneficial, but not when they are like this. An occasional spider is normal. There's nothing normal about this. We are infested with them. I am considering having a company come out and spray every year, but I have children, grandchildren, and pets that I have some concerns about the safety of using pesticides. I am the kind of person that likes to use natural things if possible, so if anyone has had a problem like this, and can give me some advice that actually works, I would really appreciate it. A few suggestions is try hanging bird nests and attracting more birds and giving habitat to any native local wild life like lizards frogs and other creatures. They will happily munch down on the spiders and eventually the spiders will wise up or be eaten. Also try not keeping you porch lights on. Spiders love outdoor lights and porches since they provide shelter from the rain and lots of moths and bugs that fly into the light. Maybe try using dim lights, or putting tinted sheets over the lights to make it less luring for bugs. Getting rid of any nooks and crevices for them to run to for safety may be helpful as well since on a web most spiders feel exposed they generally like having a nook to run to. If you don't mind some traps put some bait or small insect glue traps on the walls and ceiling with sticky strips for them to walk in to investigate only to get stuck. Or try a small bug zapper / catcher. They lure bugs and kill them basically starving the spiders out. with less food the spiders will ether have to move or will die of starvation. If all else fails there are sprats that you can sprays that you can ask professionals about that dry completely in an hour or 2 and just keep family and friends away from it for a short time till its safe. We are looking for a "pet safe" product or way to get rid of black widow spiders and wolf spiders. They are all around the outside of our home and pool area. Their webs are everywhere. Osage Oranges or "Horse Apples"
I'm in Missouri and here we use "Osage Oranges." They are green about the size of an orange and it has a pattern on it that looks like brains. They definitely get rid of all spiders. When they start to turn brown just throw away and put out new ones. Editor's Note: Another name is "Horse Apple." Wiki says, "It is a small deciduous tree or large shrub, typically growing to 8 - 15 metres (26 - 49 ft) tall. The fruit, a multiple fruit, is roughly spherical, but bumpy, and 7-15 cm in diameter, and it is filled with a sticky white latex sap. In fall, its color turns a bright yellow-green and it has a faint odor similar to that of oranges. Native to the rich bottom lands of Arkansas, Texas, and Oklahoma." I think if you have black widows that you should call an exterminator right away. A lot of them advertise pet friendly products. In fact, I had the outside of my house and garage sprayed for spiders in June and it cost $165.00 inc. tax. I have not seen a spider since. A great spider deterrent is mint oil, if you can't find mint oil try using fresh mint and just rub it all over the areas that you want to chase the spiders from. If you know someone who grows mint just cut a few sprigs and stick them in a glass of water and they will root in a week, pot up and use when you need it. Be careful when growing mint as it gets out of control. Even in a pot if you let it go to seed, you will never get rid of it! I cut the seeding stems as soon as I see them coming up.